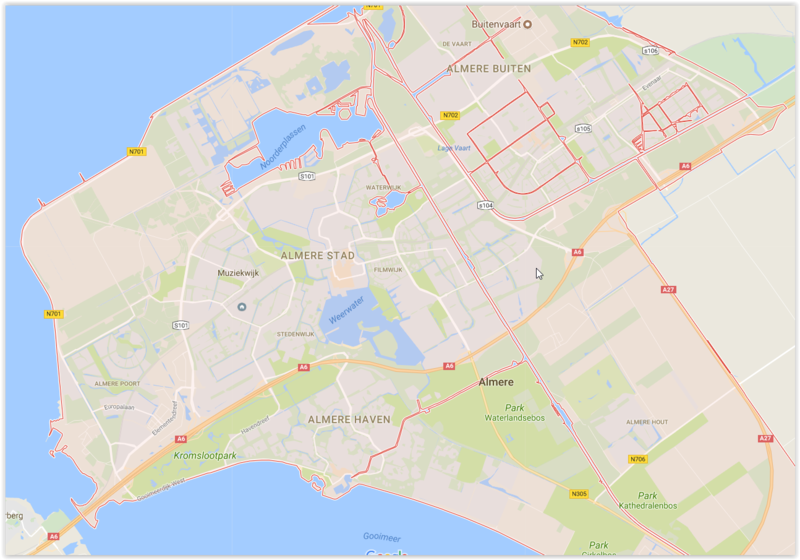 Almere is a planned city so the areas shown in the Almere Map were built at different times. Most people would guess that Almere Poort was the first area developed but in actually it was Almere Haven. After Almere Haven came Almere Stad, then Almere Buiten, then Almere Hout, and finally Almere Poort. If you would like to do a walking tour of Almere Stad, we have covered that topic on another page so just click the link. This page will focus on the entire Almere region, and what to expect in each area of the map. Almere Stad – The retail and commercial center of town. Served by Almere Centrum Station. Almere City Mall is a Pedestrian only walking mall. Amidst the shops you will find modern architectural wonders almost haphazardly placed around town. For more on this check out the Almere Architecture article. Almere Poort – The area on the water just over the bridge from Amsterdam. Served by Almere Poort station. The main beach is here. In addition, major concerts and festivals tend to use Almere Poort beach as the event area. Almere Musiekwijk – residential area between Almere Poort and Almere Stad. Served by Almere Muziekwijk station. Not much to see here. Almere Haven – The area south of Almere Stad. No train station. Only bus service. Very nice waterfront area with restaurants and bars. The dike bike paths start/end here and who can say no to a Pancake Ship? I’m not sure officially gets to claim Kemphaan, Almere Haven or Almere Hout, but sake of argument I’ll say Kemphaan is located in Almere Haven. Kemphaan is home to the fun forest, zip lines, monkey rehabilitation center, and community farm. Almere Hout – Very little development has gone on here as of yet. Almere Golf Club is located there as is a large forest park used for wedding ceremonies, Kathedralenbos. No train station. Not sure any bus serves the area well either. Almere Hout is somewhere you only get by car or bike. Almere Buiten – The area northeast of Almere Stad. Served by Almere Buiten Station. There is a huge shopping area and home center in Almere Buiten if you are planning on moving here. The big tourist draws in Buiten are the Rainbow neighborhood, Regenboogbuurt, and the Island neighborhood , Eilandenbuurt. Noorderplassen – The area north of Almere stad that borders on the nature reserve. No train station. Bus service only. This is the gateway to Oostvaardersplassen the gigantic national wildlife preserve. Almere Oostvaarders – North of Almere Buiten this is the very edge of Almere. From Almere Oostvaarders to Lelystad stretches the massive Oostvaardersplassen Nature Reserve. There is a train stop here, specifically for those looking to explore the park. You can add a bike to any train ticket for 6 euro a day.